Stroll to wherever your heart desires; after all you are walking distance to everything Red River offers! Bear Hugs Cottage - SECLUSION - Cozy Cottage - WiFi - Rustic Decor - Country Style Kitchen - Guest Favorite - Perfect for a Couples Getaway! Last Chance Mine - In Town- PET'S WELCOME HERE!- Close to River-City Fishing Ponds- Ski Area Flat Panel TV's w/ Satellite, Nicely Remodeled with Rustic Decor! Gas Grill, Gas Fireplace - Walk to Main Streets Attractions! Collette's on Mallette - 1/2 Block off Main - Near the Ski Area - Satellite - WiFi - Washer/Dryer - Fenced Back Yard w/Gas Grill - Lots of Parking - 2 Family Rooms - NEW Flooring! 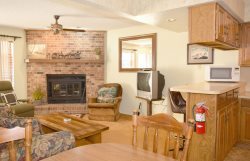 The Rustic Retreat - In Town, Beautifully Decorated & Furnished, Wood-Burning fireplace, Gas Grill, WiFi, Cable TV, Walk to Shops, Eating, & More! 1 Block from Main Street!